Le Sekiwake Mitakeumi, à gauche, après sa victoire sur le maegashira 1 Kotoshogiku. L’ôzeki Goeido partage désormais la tête du tournoi avec Onosho suite à sa victoire sur ce dernier. 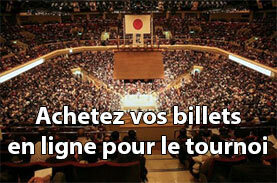 Le peu d’expérience d’Onosho (3 tournoi à son actif) ne lui a pas permis d’échapper au piège tendu par l’expérimenté Goeido lors de cette sixième journée. L’ozeki s’est habilement glissé à sa gauche et avant qu’Onosho ne s’en rende compte il était dehors avec l’aide d’une poussée généreuse de Goeido. Ça se bouscule en haut du tableau ! Désormais 4 Rikishi affichent 5 victoires pour 1 défaite. Malgré un excellent début de tournoi, l’ex-Oseki Kotoshogiku dégrade encore son ratio de victoire (4-2) suite à sa défaite face à Mitakeumi (3-3). Mitakeumi a déployé les mêmes qualités que son adversaire (équilibre et puissance dans le bas du corps) pour l’emporter. Daieisho (maegashira 11) a arraché sa victoire sur Arawashi (maegashira 9). Il affiche ainsi un ratio de 5-1. Par la suite, le n°12 Daishomaru (5-1) a infligé une troisième défaite à Asanoyama, nouveau promu de la division makuuchi. 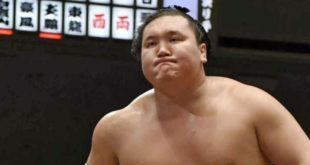 Lors du dernier combat, le Yokozuna Harumafuji (3-3) a stoppé sa succession de 3 défaites en l’emportant sur le maegachira n°3 Chiyotairyu (4-2). L’ôzeki Mongol Terunofuji, blessé au genou gauche lors de sa rencontre avec Shohozan, a déclaré forfait. 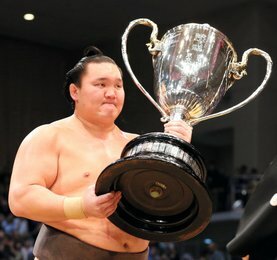 Terunofuji étant kadoban dans ce tournoi, il sera rétrogradé et perdra son prestigieux rang au prochain tournoi en novembre. C’est le maegashira Shodai qui a donc bénéficier d’une victoire par forfait. 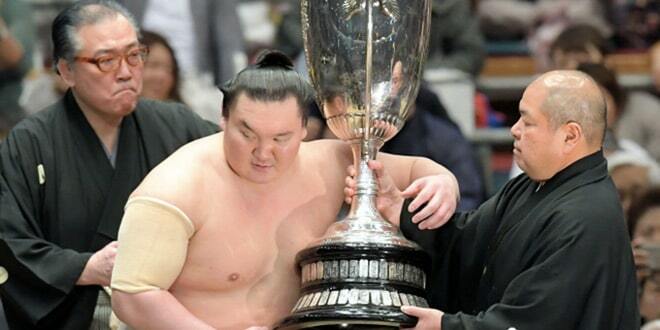 TOKYO (Kyodo) — Ozeki Goeido seized a share of the Autumn Grand Sumo Tournament lead on Friday, when he improved to 5-1 by knocking off previously unbeaten Onosho. The 21-year-old Onosho, fighting as a No. 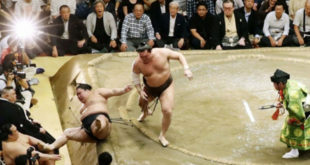 3 maegashira in just his third tournament in the elite makuuchi division, showed his inexperience as the 31-year-old ozeki led him into a trap on the sixth day of the 15-day tournament at Tokyo’s Ryogoku Kokugikan. Goeido, who had dodged several opponents’ opening charges as he searches for the eight wins he needs to maintain his rank for November’s grand tournament, moved forward as if he were trying a conventional charge, but allowed the youngster to push him backward. As Onosho appeared focused on earning a forceout win, Goeido pulled the rug out from under his opponent’s feet. The ozeki deftly slipped to his left and before Onosho realized it he was heading out of the ring with the assist of shove from Goeido. The result left four wrestlers tied for the lead with 5-1 records. Former ozeki Kotoshogiku began the day at 4-1, but suffered his second straight defeat after his perfect 4-0 start. The No. 1 maegashira, who excels at maintaining his balance while driving opponents back with his powerful lower body, got a taste of his own medicine in his loss to Mitakeumi (3-3). The sekiwake pressed forward relentlessly until Kotoshogiku changed his tack and tried to disengage. But as the former ozeki shifted his weight he became vulnerable,and the up-and-coming Mitakeumi toppled him with a beltless arm throw. No. 11 maegashira Daieisho plowed out Arawashi (4-2) to earn his first win over his ninth-ranked opponent in three career bouts and improve his tournament record to 5-1. Early in the afternoon, No. 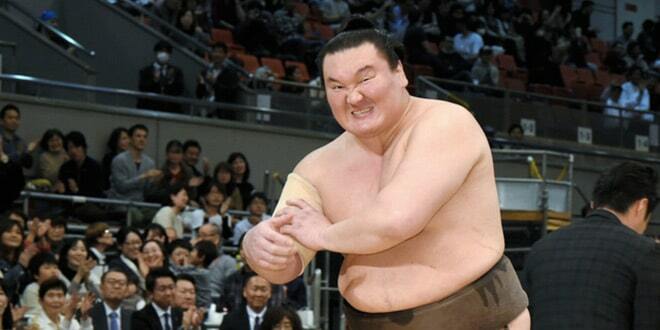 12 Daishomaru (5-1) handed makuuchi-division debutant Asanoyama his third defeat. In the day’s final bout, yokozuna Harumafuji avoided a fourth straight defeat, evening his record at 3-3 by forcing out No. 3 maegashira Chiyotairyu (4-2).